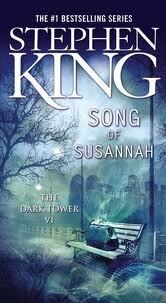 So once I got past a certain point in the Dark Tower series there was no turning back. I read the last 3 books in a huge binge but it was glorious. So glorious in fact that I have been unable to get past it and move on to another book. 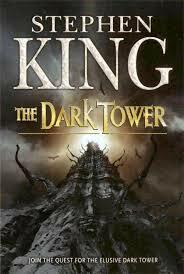 I purchased “Wind Through the Keyhole” but I am not ready to go back to the world of the Dark Tower yet either. So on to these reviews. I decided to compile them into one as I am not sure how much I will have to say about each one as they really do all fit together into a really long story. Of course although it doesn’t really need to be said, there will likely be spoilers so if you have not read the series and do not want to know about it then this is not the best place for you to be. Also my details might get all mixed up but that is the way things go sometimes. 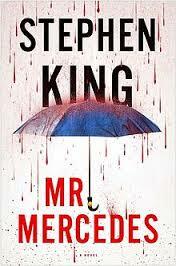 Ok so this is my last pending book review. 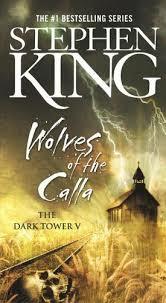 In all honesty I started reading this book last year then didn’t finish. It is on my nook which I had put aside for a while but I packed it up on my recent trip to Jamaica and finished reading it on the beach (and in my cabin during a hellish day of heat exhaustion). 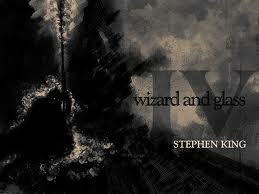 Wizard and Glass is the 4th book in the Dark Tower Series. Here are the links to my reviews of the first three books. It should go without saying that if you have not read the series and plan to that a review of book 4 will likely contain some spoilers. Wizard and Glass doesn’t move the story along very much as most of it takes place in flashback to Roland’s youth. Not to say that Roland’s story was not interesting but it did drag on for a really long time. I guess reading the Dark Tower is a journey in and of itself. We get to see how Roland became a gunslinger, and his days riding with his two closest compatriots and how he fell in love for the first time. It is a lovely and heartbreaking tale, we know most of Roland’s associates are doomed but once we get to know them through the book it is hard to see their inevitable fate. Even though there is not much progress in the big picture story of this series, Wizard and Glass was a vivid tale that I enjoyed reading and I look forward to working my way through the remaining four books in this saga. Now that I am all caught up on reviews I can get back to reading! 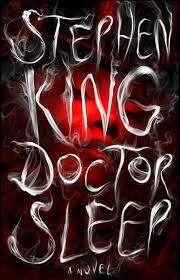 So it is pretty much a given that I will read every Stephen King book put in front of me (except 11/22/63 which has been on my shelf almost 2 years and I haven’t yet cracked the spine, maybe some day). So when I was seeking out a new audiobook to entertain me on my long drive days I stumbled upon this one and it didn’t take long for me to decide that it was for me. 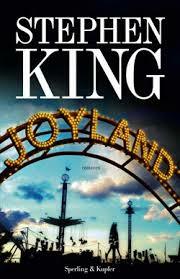 Joyland is the tale of Devin Jones who takes a summer job at an amusement park and it ends up changing his life. He makes new friends, finds a hidden talent in himself and also a murder mystery to solve and maybe even a ghost! It is not great literature but it was entertaining enough to me. Not a book I would go out of my way to recommend to someone but if they asked me about it I would say, pretty much what I just said above. Sorry for the short review, but I have a few to write here and I gotta keep moving through them.